Match Fixing in England – Surely Not? This season Essex have blooded a 17 year old left arm pace bowler, Reece Topley, who has made an impressive entrance to the First Class game. Two five wicket hauls in his first two County Championship matches have whetted the appetite for more of this outstanding young prospect once he completes his educational committments for this academic year. His pace is certainly fast medium, and his action looks like the proverbial well oiled machine, so hopefully he will not be as injury prone as some young pace bowlers have been in recent years. It may be that in years to come the game’s abiding memory of Reece’s father, Don Topley, is simply that he sired a left arm pace bowler as good as any English cricket has ever seen. For now however the mention of Don’s name stirs other memories. He was a decent cricketer himself but is best known for his role as whistleblower in relation to an allegation of match fixing dating back to 1991, that he made in 1994. 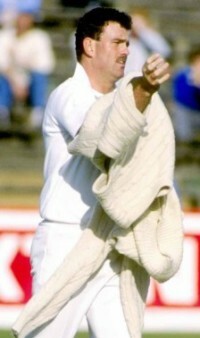 Don Topley first came to the attention of English cricket during the course of the Lord’s Test against West Indies in 1984. Then aged 20, and a member of the Lord’s groundstaff, for a time he found himself in the role of substitute fielder as a result of an injury to Chris Broad. This was the match when a remarkable 214* from Gordon Greenidge enabled the West Indies to chase down a fourth innings target of 342 in five and a half hours. They ended up passing the target with nine wickets in hand and more than 11 overs still available. That said on the Saturday morning, the third day, England had been right in the match and Ian Botham and Bob Willis were throwing everything they had at the West Indian batting as England sought and achieved a rare first innings lead. Topley’s moment came as Willis unleashed a bouncer at Malcolm Marshall. Not a man to be intimidated Marshall hooked but didn’t connect quite as he would have wished and Topley, at deep square leg, charged round the boundary and brought off a magnificent one handed catch – sadly for him and England however his momentum meant he could not avoid putting a foot over the boundary. Later that summer the tourists went on to complete their first 5-0 “blackwash”. Moving on from the Lord’s groundstaff for the following season Topley joined Essex, who he played for between 1985 and 1994. He was a steady right arm seamer, not much above medium pace, who enjoyed a couple of good seasons in 1988 and 1989, but who otherwise never quite managed to make himself indispensable to his employers and, after a poor 1993 and just a single match the following season, he left the First Class game aged 30 never to return. Before moving on to look at the two games that were the focus of Topley’s later statements it is worth making the point that match fixing is, in a sense, permitted by the Laws of Cricket, and for many years, in England in particular, was a consistent feature of the First Class game. The law in question is, of course, the one that permits declarations and forfeitures of innings. Four day Championship cricket has certainly reduced the need for “contrived” finishes to be arranged between captains, but the principle of agreement being reached that the batting side will leave the bowling side a target of x runs to be scored in y overs is as acceptable now as it was in 1991. Less frequent these days is the need for non-bowlers to then bowl their “straight up and downers” off two pace run ups designed to concede runs heavily and quickly in order to facilitate the agreed declaration, but even that can still happen. The factor that creates the scope, and some may say need, for legitimate match fixing is the nature of the draw. Many sports, particularly team ones, have rules that permit matches to be left drawn, but none in circumstances whereby similar situations can arise. Cricket provide’s its own illustration of this in its limited overs format. There a match can be tied, or left undecided because of adverse weather conditions, but there can never be a need for captains to collude to create a scenario whereby a definite result emerges from what would otherwise be a stalemate. The events with which we are concerned took place between 23 and 26 August 1991 at Old Trafford. On 23 and 24 August Lancashire were to play the first two days of a County Championship match against Essex. There was to be an interlude on the Sunday, 25 August, while the two sides played a 40 overs per side match in the Refuge Assurance League, before the third and final day of the Championship match on 26 August. Going into the games Essex were desperate for points in the Championship in order to win their contest with Warwickshire at the top and take the title. These were the days of the 17 County single division tournament and Lancashire, sitting in mid-table, had nothing to play for. In the Refuge Assurance League however roles were, effectively, reversed. Essex were mid-table and Lancashire, this game being the last of the season, could lift the trophy if they beat Essex and Derbyshire managed to beat Nottinghamshire, the only other side in contention. Days one and two were, not surprisingly given the venue and time of year, spoiled by the weather and a total of 76 overs were lost. Clearly a definite result was not going to be possible without some negotiation and the two declarations that followed demonstrate perfectly how these situations often took shape. By the end of Day 1 Lancashire were 175-5. On day 2 they batted on and were eventually all out for 246. They might have declared earlier but no doubt as part of the discussions Essex skipper Neil Foster was happy for Lancashire to bat on and for his side to have the opportunity to pick up the additional two bonus points that were available for bowling the home side out. Essex then declared their own first innings at 150-3, just as they got their first batting point. Lancashire, as any observer would expect, bowled properly and went for only fractionally over three an over – after all had they got in amongst the Essex batting 246 might have been a winning total. There was just enough time for Lancashire to get to 14-1 before the close. Next day Essex rested their best batsman, Pakistan’s not yet disgraced Salim Malik, and skipper Foster (Derek Pringle took over). They also left out future England off spinner Peter Such and replaced him with a young left arm spinner, Guy Lovell – as things turned out it was to be Lovell’s only appearance in senior cricket. Essex batted first and limped to 169 -6 in their 40 overs. Had it not been for Topley, with his highest ever List A score of 38*, helping Pringle add 78 for the seventh wicket, it would not have been that many. That Lancashire had to wait until the first delivery of their final over to overhaul Essex’s modest total and secure a five wicket victory, was in part due to Topley’s bowling spell which brought him 3-29 from seven overs. It seems odd in the circumstances he was not called upon to bowl his full complement of eight – nor indeed was all rounder John Stephenson who was even more economical. It was Pringle himself who bowled the last over and he and Lovell, who had had six overs, were the most expensive of the Essex bowlers. Sadly for the home side Notts won, so their victory was in vain, and it was a second successive season as runners-up for the Red Rose County. We do not know exactly when the deal was done between Lancashire skipper Neil Fairbrother and Foster, but the scorecard certainly suggests, that for a time at least, Essex were trying to breakthrough the Lancashire batting. There clearly was a deal as eventually Nick Knight and Nasser Hussain came on to bowl and conceded 73 runs in just over 10 overs to hasten Lancashire nightwatchman Gary Yates to his century, and Fairbrother to a declaration that left Essex to score 270 in a minimum of 67 overs to win. Half centuries from Stephenson and Malik and a century from Nick Knight, playing only his fourth First Class match, paced the innings perfectly and saw Essex home with just two wickets down. Essex were crowned County Champions at the end of the season. Without the 16 points that came their way for beating Lancashire they would have missed out on the title. The Essex decision to rest players for the Sunday game is easily explicable and, certainly in isolation, perfectly reasonable. Malik had retired hurt in the first innings of the Championship game with a hand injury. It would have been foolish to risk him in a meaningless match when he was likely to be needed on the Monday. Similarly Foster had had a long season and, had he been able to break through on Monday morning, an Essex victory chance might have come about by more conventional means. As for Lovell the decision, in the circumstances, to blood one promising youngster, is difficult to criticise. Fairbrother’s captaincy is rather trickier to understand. At the start of the match Essex had a game in hand on Warwickshire and were 14 points behind them in the table. Essex had to win and, accordingly, had no choice but to go for whatever target Fairbrother decided to set them. Wisden described the declaration as “generous”. One journalist was rather more forthright; “A stunning tactical aberration”. Lancashire supporters, who were interested only in winning in order to put as much distance as possible between ourselves and our old rivals from across the Pennines, were totally bemused by the decision. It is true that one end had delivered some uneven bounce early on, and in addition to Malik our own Gehan Mendis had sustained a hand injury to show for it. That said the wicket had clearly flattened out as evidenced by the events of the Lancashire second innings. Essex would undoubtedly have had a real go at 350 in 50 overs, and the pressure such a chase would have brought with it would surely have given Lancashire an infinitely better chance of victory than the one they ended up with. In fact the cricketing events of those August days in Manchester were forgotten until the game suffered a rude awakening on the morning of Sunday 13 November 1994 when the headline “Cricket’s Crooked Too” appeared on the front page of the Sunday Mirror. Interviewed for the article were Topley and Lovell. Topley said “We were given a nod and a wink that if we happened to lose the Sunday game then we would get an easy declaration on the Monday”. Lovell went further and said that Foster announced to the team “We have done a deal. If we lose today we win the three day match tomorrow”. He added that an unnamed senior player(s) had told him not to bet on the match. In view of subsequent events it is perhaps surprising that no full enquiry took place. The Test and County Cricket Board, as well as both clubs, said thay had fully investigated and found nothing to substantiate the allegation. On being told of this Topley commented, with remarkable prescience, “I believe this matter will return to haunt them”. Wisden mentioned the allegations in its 1995 edition, but only in the commentary on Essex’s season, and no mention was made in the authoritative “Notes by the Editor”. By the end of the decade the match fixing scandals that brought down Salim Malik, Mohammad Azharuddin, Hansie Cronje and others were in the full glare of publicity and, the best part of a decade on, the ECB, successor body to the old TCCB, after starting its own examination of events in the summer of 2000 felt obliged to refer the Essex/Lancashire match to Scotland Yard for investigation. Perhaps surprisingly the Anti-Corruption Unit of the ICC, headed by former Commissioner of the Metropolitan Police Sir Paul Condon, were not invited to investigate the matter. What did the police do? The details of the investigation have never been made public but they certainly, and inevitably given the overall circumstances, and particularly the lapse of time, concluded that nothing could be proved. It seems neither Topley nor Lovell were interviewed and it seems highly improbable therefore that any other players, or the umpires, would have been. In fact the problem has, effectively, gone away and the time bomb if, which I doubt, there ever was one, has been defused. Rule changes have helped. No longer do limited overs matches get caught up in Championship matches and the problems of contrived finishes brought about by three day games has lessened as four day cricket has taken over. The awarding of points for draws has doubtless also contributed to an increasing reluctance on the part of captains to tinker with the natural order of games and the establishment of the two division Championship means that there are fewer games now where the outcome is meaningless for one participant. Berry’s rationale for his belief that the matter would resurface arose out of his expectation in the future that as “…their bonds of loyalty to teammates gradually dissolve..” more disclosures would be made by those involved. He also expressed the view that Malik, given his invidious situation generally, might choose to speak out, given that there has never been any suggestion that he was involved in the “negotiations” in this case. I was never convinced by either argument and nobody has since come forward. I have no doubt that one day the life story of Salim Malik will be published, but I am struggling to see that this particular episode will be of any importance to him or a biographer. As to the other participants why on earth would they choose to risk, however unlikely, a criminal investigation by stirring up a furore from which they would inevitably emerge with little credit? In fact only three of the players involved published autobiographies after 1991 and, with one possible exception, it is unlikely that any more will. Of the Lancashire side Ian Austin and Wasim Akram simply made no mention of the events of August 1991 which leaves just Nasser Hussain, then 23 and a junior member of the Essex side. In his bulky 2004 autobiography, Playing With Fire, Hussain does at least have the courage to tackle the issue, albeit briefly, but his version, which I suspect is as close to the truth as we will ever get, is somewhat non-committal. Hussain does give some support to Topley’s account but also makes sure that no one emerges with any criticism. Effectively what Hussain says was his understanding of the position, and he is at pains to point out that he was not in any way involved in the discussions, was that Fairbrother initially refused to set a target, but was left with the message that Essex would be making changes to the Sunday team, and that they hoped he might reconsider, and that what followed, after the Sunday game was over, was the sort of discussion about runs and overs that went on up and down the country day in and day out through the Championship season. Of the other participants I suspect only Derek Pringle, now cricket correspondent of the Daily Telegraph, is ever likely to go into print. Given the conservatism inherent in the views of his employers I think it unlikely that the “Topley Affair” would get a mention, or that if it did it would be dealt with in anything other than a similar manner to the Pringle approach back in 1994. Something else confirmed by Hussain is that in the Essex dressing room of the late 80s and early 90s “Toppers” and “Pring” were rather less than best mates. So have we had match fixing in English cricket? All things considered it seems to me that we probably have, but in a relatively innocent and forgiveable way – just for the glory don’t you know – no bookies and no money changing hands (and at this point I would ask that there be no mention of prize money, thank you very much). The astute amongst you may have detected a hint of sarcasm in my last sentence. In that you would be correct of course, but it is only a hint, and I do not think match fixing of the most nefarious kind has taken occurred in England, well not since the mid 19th century anyway. The fact remains however that we are not perfect by any means, and really ought to stop adopting the holier than thou attitude that we do towards certain other cricketing nations. *Warwickshire were scheduled to play Nottinghamshire in a County Championship match on 22, 24 and 25 August 1981 with a Sunday League game on 23 August. Warwickshire were looking to retain the Sunday title and Notts were looking for their first Championship since 1929. Warwickshire made 331-9 on 23 August a position which, in a three day game should, realistically, have made them safe. Next day Notts’ openers in the 40 over game put on 188 before, strangely, running out of steam and ending up on 231-3 with a succession of young batsmen getting to the crease ahead of skipper Clive Rice. Warwickshire comfortably made the runs. One odd feature of the Warwickshire innings was that Basharat Hassan (a total of six First Class and five List A wickets over a long career) bowled four overs for as many as 33, whereas Rice, an international quality fast medium bowler, did not bowl four overs of his allocation. Another was that like Essex a decade later Notts had made three changes, resting England opener Tim Robinson, experienced batsman Paul Todd, and the great Richard Hadlee. In the Lancashire case they agreed to set a generous target but still tried to win the game. In the Warwickshire case Bob Willis left the ground with a suitcase full of ?5 notes. This is why fertang is the Mack Daddy of CricketWeb. Tremendous piece. I commented (on cricsim I believe) at the time of Reece Topley’s debut that I was a little surprised to see a Topley turning out for Essex given the animosity and ill feeling between Topley Snr and Essex at the time. I think it was more a product of one league in both comps and a lot of meaningless matches for many teams, maybe a nod and a wink. You caught a whiff of it last year with Lancs appalling last-day performance against Notts, nothing untoward just a team lacking the will to deny the other a point. The game afterall was already drawn and Lancs position in the table was secure. Hopefully two divisions and several comps mean that all this is far behind. Excellent article.The old days of the 1980s three day matches and a Sunday League game in-between would have resulted in many earnest dressing room discussions for the county captains.In no other sport than cricket is the role of captain so potentially influential.